Welcome to Richmond International Raceway’s Fan Appreciation Weekend! RIR has always been one of my very favorite tracks. 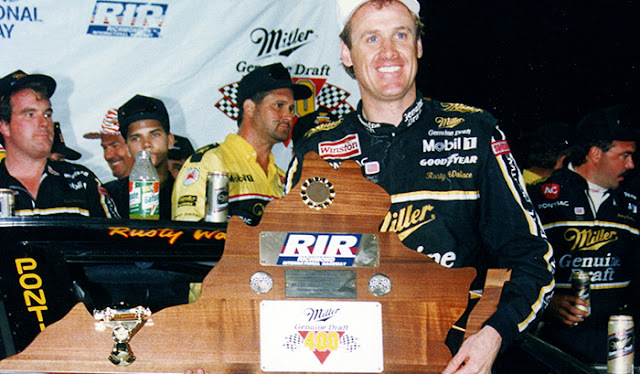 It produces some of the best, most exciting, door-to-door racing in NASCAR and I was fortunate enough to have a lot of success there, with six wins, 22 top-fives, 30 top-10s and over 3000 laps led. In fact, Victory Lane at RIR was where my favorite car, Midnight got its name. At Team Penske, we had a tradition in which a car didn’t earn a name until it won a race. Well, in September of 1992 at Richmond, we won a hard fought victory over Mark Martin and Darrell Waltrip in the debut of a brand new car, chassis number PSC-009. We were in Victory Lane—around the stroke of midnight—when my PR representative, Tom Roberts, suggested that we name the new car “Midnight.” I agreed and from there, a legend was born. Midnight went on to be one of the most famous cars in NASCAR history, with 13 wins, 25 top-fives and almost 4,000 laps led in its 31 races. 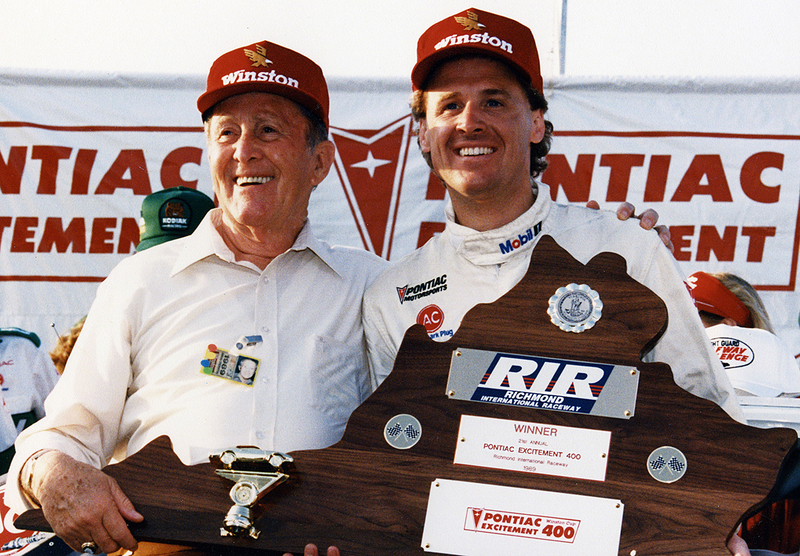 All of that success began at Richmond International Raceway. But it’s not just my on-track success at Richmond that makes it one of my favorite venues. I really love the city of Richmond as well; it just has a great vibe. Richmond has so many awesome restaurants and entertainment options that make it a favorite stop for all of the drivers and teams. Even more than that though, YOU—the Richmond racing fans—are some of the very best fans in all of NASCAR. The support that you show for our sport—as well as the passion and loyalty you show to your favorite drivers and teams—really means a lot to me and to everyone involved in our sport. From the bottom of my heart, I’d like to thank all of you for your support of NASCAR and Richmond International Raceway. We’re looking forward to making even more racing history in Richmond this weekend! Sunday, March 2, 1997 – The Pontiac Excitement 400 at RIR was nothing less than exciting on a crisp, sunny Sunday afternoon. While some folks may remember it as the last regularly-scheduled day race at RIR before moving to a night-races-only schedule for the next eighteen years, others are probably more familiar with the on-track action that took place that day. After starting 7th, Rusty Wallace tangled early with Ricky Rudd on lap 6, immediately putting him all the way in the back of the field. 371 consecutive green flag laps later – yes, you read that right – without any help from a caution flag, Rusty working his way through traffic all the way up to P1. Jeff Gordon and Dale Jarrett controlled much of the first half of the race, especially Jarrett who racked up 172 laps led over the course of the 400-lap event, until Rusty jumped back on the scene to take over the lead on lap 159. The two battled it out for the next 43 laps when Jarrett finally snatched it back. At that point, it looked like Jarrett might be able to hold on to the lead for the rest of the race, even with the momentum clearly in Rusty’s favor less than 100 laps ago. But, during Jarrett’s final green flag pit stops he lost nine seconds due to dropped lug nuts, costing him the lead and putting Rusty back in prime position for the checkered flag. Remember now, the last – and only – caution flag up ‘til now flew back on lap 6. With 19 laps remaining in the race, Kenny Wallace’s engine blew, giving Jarrett a huge break, much to his brother’s chagrin. At this point, there were only four cars still on the lead lap: Rusty, Jarrett, Geoff Bodine, and Ernie Irvan. In the top spot one lap down, Jeff Gordon connected with Irvan while trying to line up for the restart. Seven laps later, Irvan hit the wall in Turn 4 hard with a cut tire, for which he blamed Gordon. Later, Rusty would say: “I was real surprised at Gordon. He might have thought he was racing for the win. I don't know. I've never seen anybody race like that with the leaders when he's a lap down, but he did." Back to lap 398 – we’ve got three to go ‘til the end, putting Rusty, Jarrett, and Bodine in a three-car shootout for the win. Rusty’s long history of short-track racing served him well – he smoked Jarrett to hold on to the lead. "You think about those old short-track days," Wallace said. "I laid back about a car length and a half, and, just about the time I thought [Jarrett] was going to pick it up, I nailed it. It worked out perfect." Jarett would claim a third-place finish, after losing both the chance at the win and a rough battle with Bodine for second. Don’t feel too bad for Jarrett thought, he returned to the fall race at RIR with a vengeance. On top of winning the Exide NASCAR Select Batteries 400, his average speed of 109.047 easily topped Rusty’s during the spring event. However, you’d be hard-pressed to find another performance like Rusty’s during that final day race. 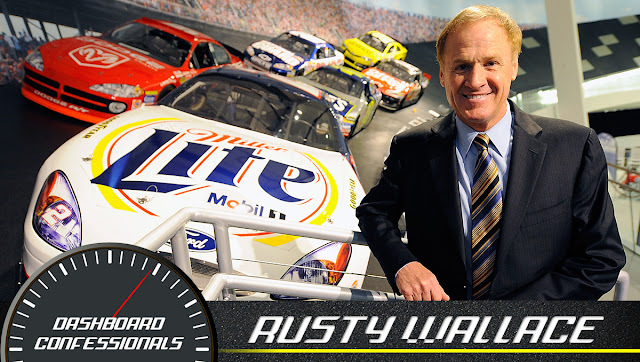 In Rusty’s own words: "You know the [car] is stout when you go from 41st to first, and pass them all and take the lead. I'm used to taking the lead via pit stops and maybe passing one or two, but I've never passed 41 of them. That was a tough one." Indeed; an RIR tradition of exciting, tough racing on Sunday afternoon we’re excited to see return in 2016 and beyond. Be there to witness Sunday short-track racing make its historic return to Richmond International Raceway on April 22, 23, and 24th. Lock in your tickets today by renewing for the 2016 season. Need tickets? Sign up here to be the first to get yours before they go on sale to the public January 15th. 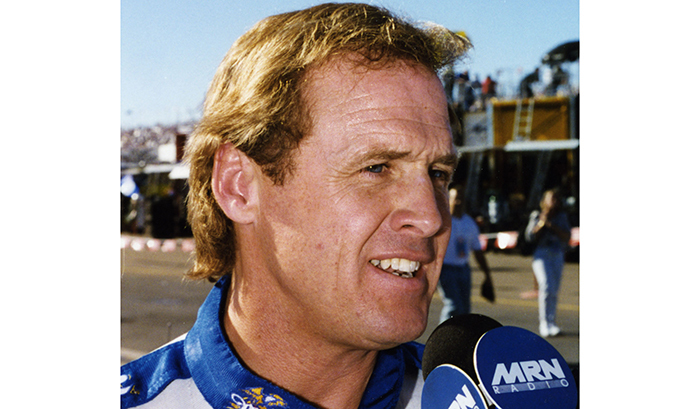 NASCAR Hall of Famer Rusty Wallace shares his thoughts on Richmond's shift to a Sunday race. When I heard about the possibility of a Sunday race coming back to Richmond, I got really excited about it. It really brings back the history of Richmond. When I came into NASCAR it was always Sundays; bright, sunny, everyone saw the cars gleaming under the sunshine – it was a NASCAR tradition. I remember the days when night racing started, and it was definitely dramatic. We'd see flashes going off around the track when someone took the lead, and it was exciting, it was really cool. But sometimes change is good, especially when we're going back to tradition, and there's nothing wrong with tradition. I moved down from St. Louis, Missouri to chase my NASCAR dreams, but my whole family would come out on Sunday afternoons to watch me race. I remember people piling onto the tailgate of our truck and everyone being there for the big event that day. There's just something about being under the bright sunshine that seems right to me. Wallace has six wins at RIR, three of those coming during the day. I won a lot of races on Sunday afternoons, and had a good time doing it. I think it's going to be exciting and something different to the fans of RIR. Now, I know there might be some of you who have never seen a scheduled day race at RIR. Let me tell you what to expect: you're going to see more cautions, you're going to see more action and more passing. I can say that because I know the track is going to be slicker, it's going to be hotter, there's not going to be nearly as much grip and it's going to be more exciting- that's just all there is to it. It's a win-win for fans at the track and at home. The drivers and owners can bring more people out to the track now, so I expect we'll see more going on around the race, more entertaining and more fan festivities. Personally, I can see myself coming into Richmond earlier and spending time with the fans on Saturday nights. For the fans at home, Sunday afternoons are when they have a little time to sit down and spend some time watching some really good NASCAR racing at Richmond. With this change there's going to be a lot more eyeballs on the track on a Sunday afternoon. I think it'll be fun and I think there are a lot of positives ahead of us. We can't forget where the sport came from, so I'm all for this change.